Math Mammoth Grade 4 Complete curriculum - description, samples, and purchase info. Math Mammoth Grade 4 Complete Curriculum is a complete math program for 4th grade, providing you with everything you need to teach 4th grade math. It is available both as a download version and as printed copies. You can purchase Math Mammoth Grade 4 as a download, on a CD, or as already printed books. Another option is to purchase only the student worktexts as printed books, and get a digital version of the supportive materials: answer keys, tests, cumulative reviews, worksheet maker, and software Soft-Pak. Use this link to add the supportive materials to your shopping cart ($8.95 USD). You can purchase a lesson plan for Math Mammoth Grade 4 to use it in Homeschool Planet online planner. Learn more. This workbook is supplemental, and provides additional practice for the topics in the curriculum. I recommend you only purchase it once you are sure the student does need supplemental practice. Learn more. At the heart of the curriculum are two student worktexts (A and B), each covering about half a year of math work. These worktexts contain all the instruction and the exercises in the same book — which makes lesson preparation a breeze. The worktexts are written directly to the student, and thus they allow many children (if they can read) to teach themselves and to learn directly from the books. You will also get separate answer keys, chapter tests, additional cumulative reviews (I do recommend you use at least some of them), and a versatile worksheet maker (Internet access required) for those times when your child needs just a bit more practice. Math Mammoth focuses on conceptual understanding. It explains the "WHY", so your children can understand the math, not just learn "HOW" to do it. Concepts are often explained with visual models, followed by exercises using those models. These visual models can take the place of manipulatives for many children; however, it is very easy to add corresponding manipulatives to the lessons if so desired. The curriculum is mastery-oriented. This means it concentrates fairly long on a topic, delving into its various aspects. This promotes conceptual understanding, as opposed to spiral curricula that often tend to jump from topic to topic too much. There is a strong emphasis on mental math and number sense. It requires very little teacher preparation required. The curriculum has no separate teacher's manual nor is it scripted. The introduction to each chapter has some notes for the teacher concerning the material in the chapter. All the instruction is written directly to the student in the worktext, and there also exist accompanying videos where you can see Maria herself teach the material. After each chapter introduction, you will find a list of Internet links and resources (games, quizzes, animations, etc.) that can be used for fun, illustrations, and further practice. "It was so much fun….and I’m not being sarcastic!! I loved all the thinking my little man was doing." BONUS! If you purchase the download or CD version, you will also get Soft-Pak programs completely FREE. The 6 programs in Soft-Pak (4 math, 1 language arts, 1 list maker) offer both on-screen and printable activities in a low-graphic, high content format. Read more and see screenshots. In the fourth grade, students focus on multi-digit multiplication and division, learning to use bigger numbers, solving multi-step word problems that involve several operations, and they get started in studying fractions and decimals. This is of course accompanied by studies in geometry and measuring. The year starts out with a review of addition and subtraction, patterns, and graphs. We illustrate word problems with bar diagrams and study finding missing addends, which teaches algebraic thinking. Children also learn addition and subtraction terminology, the order of operations, and statistical graphs. Next come large numbers—up to millions, and the place value concept. At first the student reviews thousands and some mental math with them. Next are presented numbers up to one million, calculations with them, the concept of place value and comparing. In the end of the chapter we find out more about millions and an introduction to multiples of 10, 100, and 1000. The third chapter is all about multiplication. After briefly reviewing the concept and the times tables, the focus is on learning multi-digit multiplication (multiplication algorithm). The children also learn why it works when they multiply in parts. We also study the order of operations again, touch on proportional reasoning, and do more money and change related word problems. The last chapter in part A is about time, temperature, length, weight, and volume. Students will learn to solve more complex problems using various measuring units and to convert between measuring units. In part B, we first study division. The focus is on learning long division and using division in word problems. In geometry, we first review area and perimeter, and then concentrate on the topic of angles. Students measure and draw angles, solve simple angle problems, and classify triangles according to their angles. They also study parallel and perpendicular lines. Fractions and decimals are presented last in the school year. These two chapters practice only some of the basic operations with fractions and decimals. The focus is still on conceptual understanding and on building a good foundation towards 5th grade math, where fractions and decimals will be in focus. When you use these books as your only or main mathematics curriculum, they can be like a "framework," but you do have some liberty in organizing the study schedule. Chapters 1, 2, and 3 should be studied in this order, but you can be flexible with chapters 4 (Time and Measuring) and 6 (Geometry) and schedule them somewhat earlier or later if you so wish. Chapter 3 (Multiplication) needs to be studied before long division in Chapter 5. Many topics from chapters 7 and 8 (Fractions and Decimals) can also be studied earlier in the school year; however finding parts with division should naturally be studied only after mastering division. Please also see the table of contents 4-A and 4-B (in the sample files), which will let you see the topics covered in more detail. "...One of our favorite parts of Math Mammoth is that it is so easy to understand, your child can literally teach themselves. There is no teacher’s book that forces parents to spend hours reading aloud boring material. Instead, each lesson has a short section that the kiddos can read on their own. " For $9.95, you can purchase a lesson plan for Math Mammoth Grade 4 in order to use it in Homeschool Planet online planner. Learn more. 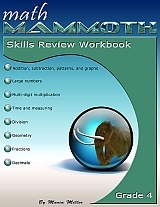 Math Mammoth Skills Review Workbook, Grade 4 provides additional practice for the topics in Math Mammoth Grade 4 curriculum. I recommend you only purchase it once you are sure the student does need supplemental practice. Learn more. Here is a list of manipulatives that are needed or recommended for grade 4. Measuring tapes are only used in the measuring chapter. A ruler that measures in inches (for 4-A and 4-B). A ruler that measures in centimeters (for 4-A and 4-B). A measuring tape that measures in feet (for 4-A). A measuring tape that measures in meters (for 4-A). A kitchen scale that measures in ounces (for 4-A; used only in one problem). Measuring cups that measure 1 cup, 1/2 cup, and 1/4 cup (for 4-A; used only in one problem). Fraction manipulatives. The curriculum contains printables to make your own fraction manipulatives. The text uses visual pie models extensively, and students even learn to draw them themselves for the exercises, therefore making or buying the manipulatives is entirely optional (optional; for 4-B). I just wanted to tell you that I just moved my son from Horizons math to your Math Mammoth. Mostly because I wanted a mastery-type curriculum and yours was highly rated and also suggested by Math Without Borders. He is doing so well with it and it's hard to believe that just after a few weeks his mental math has improved incredibly. He loves the workbook and the games are excellent and has been a great motivator for him. Engineering is in his future so I wanted to hit math hard this year to prepare him for Math without Borders. Thank you so much for all of your emails and care taken with your curriculum. He will be getting a Mammoth stuffed animal for Christmas!! "Math Mammoth utilizes color in their books. This is a HUGE bonus in my opinion. It can be very monotonous to stare at page after page of black and white numbers, especially for little ones. Things like the fractions you see here are so much more interesting, and easier to explain when you have color designations." New to home schooling, I felt overwhelmed trying to pick out a suitable curriculum to suit a 1st and 4th grader (in particular), having come through regular school up to 3rd grade. Both kids are enjoying Math Mammoth so far. The hints and tips for mental math throughout are great. The program provides flexibility if a student is struggling on something because I can hop back and print out some 3rd grade reminders of key concepts. I love that I can generate extra worksheets of different problems online anytime - brilliant. We haven't got far enough yet to use the chapter reviews but glad that they are there for us when we're ready. The pricing through homebuyers is amazing to cover both students through 8th grade if we so choose. I chose to do the download option and print as we go. I would recommend this product (and a good printer!)." I've been using Mammoth for 3 years now. I teach fourth grade and my students love it! They can work as ability allows and now I actually have to buy the 6th grade program for some of my higher students who have breezed through 4th and 5th grade math! We love Math Mammoth and especially the fantastic deal we got through the Co-op to download everything! I love that we have topics as well as grades, so if my DD is struggling with something we can go back and cover it by topic to review, or use the reviews from previous grades. I love how the material is presented and it really makes sense. The mastery system is great because I feel my daughter can work to 'get it', rather than the old system we used which was spiral and often I found she didn't understand a lot of what we'd covered. Finally, I like that it is not overly difficult for grade level, but about right. It gives my daughter confidence and there is still challenge in the puzzle corners, which we do together and she really enjoys. Other curriculum we have used has had a lot of extra stuff, which often my DD has not been ready for, so we've ended up going down a grade level, but then some of it was too easy. She's in fourth grade and sometimes she works independently, and other times I need to work through the explanations with her. My daughter in first grade also uses some of the lessons, but at that age I tend to do more real life maths, aka Ruth Beechick. What we have used I really like, as it's all concrete - with pictures etc for the numbers. We will continue to use this, definitely, it's the first programme I've been totally happy with. My younger daughter loves it. My elder, really, really doesn't lke math, but she does really quite like Math Mammoth, so that's a pretty impressive accolade! 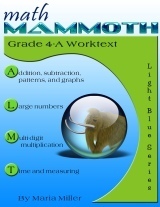 I have recommended Math Mammoth to all my home ed friends, because our family think it's great! I also recommended the Co-op deal. I just wanted to write to thank you for your curriculum. I have been using your fourth grade materials for a student I am homeschooling and have been very impressed with how well it works! When I first arrived, he told me he wasn't good at math and didn't like it. I noticed very quickly that he hadn't ever learned division so I immediately downloaded the division mini-unit and we worked through that. He still complains that he doesn't like math because it's too hard but I have enjoyed hearing him say to himself, as he's working, "This is so easy!" We are getting into the standard multiplication section so I am interested in seeing how the pieces come together to help him understand not just the steps but why they work the way they do. I am in Cambodia so I have been very thankful for the ease in downloading the materials and printing them out. It saves on weight, which is always a plus. I'm looking into curriculum for next year and I expect to continue using MathMammoth for our math. Thank you for your work with it! Added: We have now passed what I thought would be a "hurdle" going into standard multiplication and that day has come and gone completely painlessly! Very thankful for it. My son is doing great with these materials. He was able to complete all of grade 4 in 5 mos with excellent comprehension and retention. I really don't know what we would have done without it. I recommend your course to many parents in my area. Lots of kids at the Waldorf school are struggling with math and looking at the materials they are using there is no question about why that is so. They end up with rote memorization of their tables and then do not have quick recall because they have to go through the whole silly song they learn instead of having great recall of the visual as well as the sense of the problem. The way you have your workbooks designed to encourage mental math is excellent. Jonathan prides himself on being able to work the word problems in his head as much as possible - something sorely missing in math education today. please let me take this opportunity to thank you for your fabulous Math Mammoth program. * it is virtually self teaching. My daughter prefers doing her math on her own and rarely needs my help. She is getting it! Your explanations are wonderfully clear, Maria. * it is very rigious and the chapter length is just right with 2-3 pages. * your warmheartedness and dedication to provide a good curriculum shine through. * it is very affordable. I also wanted to mention, that I really appreciate your recommendations/comments on how to continue after finishing 6th grade. I value your opinion and input on this. Thank you for taking the time to review the curricula. May I mention that my older daughter does Life of Fred parallel with Math Mammoth, an approach that proved extremely worthwhile for us. Concepts are constantly mutually introduced and/or reinforced, helping her to get a really good foundation in math. It is also not as time consuming as it might sound, since we take Fred on a more relaxed and slower basis. She is now working with Math Mammoth 5th grade (almost finished) and Life of Fred Pre-Algebra with Biology (about 1/2 way through). In general, I would like to say, that Math Mammoth is easier to work with independently for grades 3 and up. It was in some way very difficult for my 2nd grader, since he would 'need' more pictures and definitely more one-one-one teaching. I felt that Math Mammoth was sometimes quite abstract and harder to understand for him. For this reason, I will give it another year before using Math Mammoth with him. On the other hand, my youngest son might benefit from Math Mammoth right away since math seems to be 'his thing' and he is very quick in getting and using even abstracter concepts. To sum it up, I cannot thank you enough for your program and I am extremely happy that I found Math Mammoth. I just had to send you a message to tell you about our recent proof of success using Math Mammoth. Our state requires standardized tests each year for homeschoolers and we just received this year's scores for my daughter in the mail. 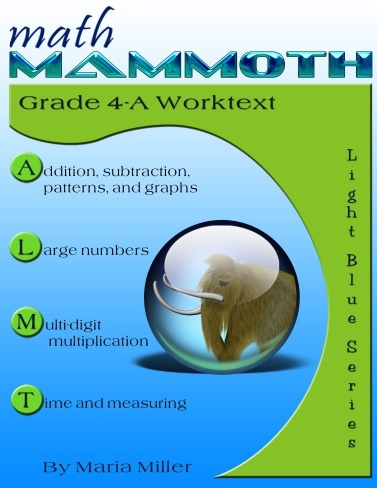 We started using Math Mammoth during the second half of my daughter's 4th grade year and used it for the complete 5th grade year which has just concluded. Even though we used the 4th grade level Light Blue book for her 5th grade year, her Math Total score jumped 36 percentage points from last year to this year! Especially taking into consideration that she was taking a 5th grade level test, I find that level of improvement absolutely remarkable! Thank you so much for such a wonderful product that is so wonderfully easy to use! Hi there, I have to say, I'm thrilled with the work books! My 11 yo was really struggling. Although her grades claimed a math aptitude, she was missing many concepts. We also discovered that our province was a year behind! She is currently working through the 4th grade book and doing extremely well. We have been using the lightblue series level 4-A. I really have been raving about it since. My son was lost in the math jungle, until we got your program. He just did not understand the other program we were trying. It had new material everyday and he did not understand the concept learned or the new one being taught. He needed my help to complete every problem and was falling behind in math. So, I got on the computer and browsed through your material again. I had been looking at it, but no one that I knew of was using the light blue series. Well, it took me all of about 10 minutes to get my file. We began the series the next day, after about a week or so I could tell that things were finally sticking. He is already catching up in areas where he was having great difficulty before. The reason for this I believe is how each lesson/chapter is set up. Each lesson and chapter build on one another, but the student is given plenty of examples on how to do the work and plenty of practice without beating a dead horse, so to speak. He now feels smart in math and for that you can not put a price tag on. I also feel that your materials are very affordable, most math programs cost a great deal more, but in my opinion are not quite so thorough. Thanks for creating such a simple yet effective way to learn math.